How are the motorways numbered? Well, it's a long story. However, this feature is designed to show how the numbering scheme works, and we'll also take a look at some of the rejected ideas that were brought up as serious proposals. There are also several maps that will be updated over time, showing some of the different numbering schemes under consideration, and a list of all the known numbers will slowly be revealed, and updated as more come to light through research. OK, let's get started then! But before I do, we need to have a look at the situation in place before the coming of the motorways - the system that is still used today to number classified all-purpose roads, in other words all A and B class roads. Tell me about the all-purpose system then! 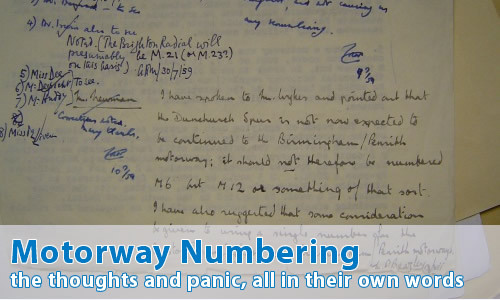 Firstly, the numbering system in Great Britain is separate to that in Northern Ireland. The Irish system (as the present Republic of Ireland was part of the United Kingdom when the plans were drawn up) does not concern us here. The numbering scheme was first thought about in 1914, as a method of simply identifying roads for internal Government use, which included such things as standardizing rates of grant for road improvements according to the road's importance to traffic. Classification allowed grant to be fixed at rates of 75% for Class I (or A roads) and 50% for Class II (or B roads). Some work started on the survey, and then came to a crashing halt almost as soon as it started due to a small thing called World War I. After the war, work started back up again, and the system was published in 1922. The system works in a series of "zones", based around London and Edinburgh, and using the single digit A roads as boundary markers. Basically, that means that any road that starts between the A4 and A5, for example, has a number that begins with 4. The exception is that the boundary between the 1 and 2 zones isn't the A2, but the Thames. This can be seen very easily by looking at any map of north Kent! Generally, the smaller the number of digits of a route, the more important the road was considered in 1922. This, then, was the situation in place before the arrival of the first motorways. Well, first the decision had to be made about what to do about numbering the motorways! Whilst that sounds flippant, there's a serious point. Should they be numbered as part of the current system, or given a whole new one of their own? Should they be allocated A numbers, or given a prefix letter in their own right? Meanwhile, planning on the motorway schemes was at full-steam ahead, and still the Ministry dithered about what to do. This delay meant that most early plans are almost never referred by number, but instead by name. For example, you get London to Yorkshire Motorway, North of Birmingham to Bristol Motorway and so on. There are also references to motorways in the London area named after the transport corridors that they are in, rather than a literal interpretation of the name. For example, Brighton Radial simply means a motorway along the corridor of the Brighton Radial (A23), not literally a planned motorway all the way to Brighton. Other examples are Exeter Radial (now M3) and Norwich Radial (now M11). Generally, the plan for motorways to be given their own numbering scheme gathered pace, and the only reference to a motorway being given a number as if it was part of the all-purpose scheme (as above) is a reference to the London to Yorkshire Motorway being temporarily assigned the number of A50. So, we'll take a look at some of the proposals in detail, and take a look at the process that brought us to the system of today. Part 1 - Where do we start? Thanks to Jonathan Winkler, Chris Marshall and Mark Dillon for their help towards the production of this feature.